The hilarious sequel to David Lawrence’s much-loved book Fox Swift. With wacky cartoons and expert footy tips from Hawthorn champion Cyril Rioli, this book is a gripping page-turner that will have kids cackling from start to finish – even the most reluctant reader won’t be able to put it down. 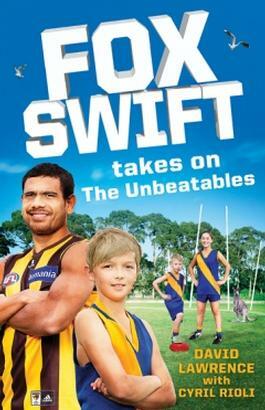 Fox Swift is really excited about captaining the Davinal Diggers for a second season. Who wouldn’t be? The Diggers have Aussie Rules superstar Cyril Rioli lending his football expertise, a whole lot of quirky players, a bunch of sensational new players, and let's not forget their quirky mascot: a kangaroo with serious attitude. But Mace Winter and his father Miles have hatched an evil plan to stop Fox and the Diggers from defending their premiership. They have sneakily recruited the best footballers from all the other teams in the competition to make up a formidable Dragons team they call ‘The Unbeatables’. Can Fox and his friends avoid detentions, dirty tricks and a rat plague to bring home an unlikely premiership for the Diggers? Be the first person to tell us what you think about Fox Swift takes on The Unbeatables and you'll save $5 on your next purchase!